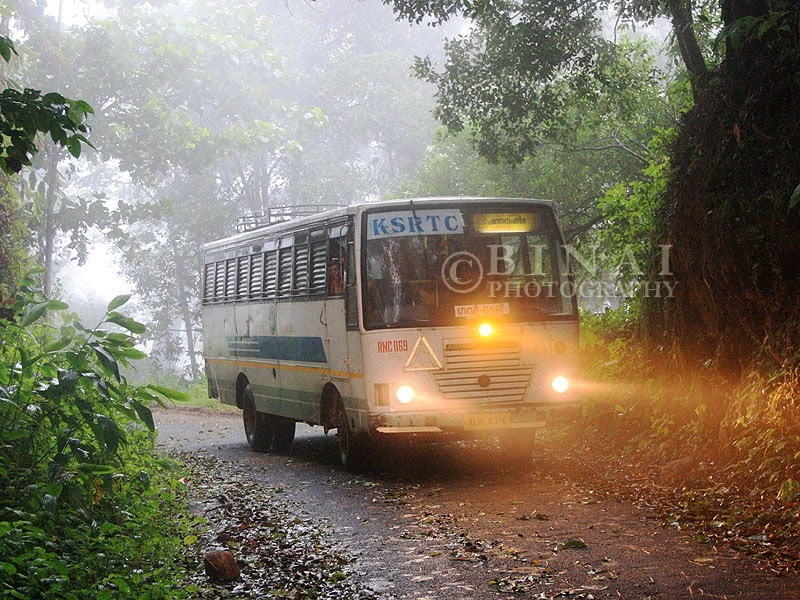 A photo showing a Kerala RTC bus making its way through dense fog through a place called “Gavi”, appeared in a famous Malayalam magazine sometime in 2009. I had never heard of this place anytime before this article appeared. The travel freak in me took me to Google Maps – I understood that this place was nestled deep in the forest somewhere in Pathanamthitta district of Kerala. After some Googling around, I discovered that Kerala RTC operates a couple of services to this place. All these in formations ignited that desire to visit Gavi. Years rolled past – a lot of photos from this place appeared on the internet, including a marvellous travelogue on Team-BHP. Given the road conditions, I had ruled out driving there – but taking the bus was still possible. In the mean time a marvellous rollicking comedy movie, Ordinary introduced Gavi to Keralites. I had almost forgotten about Gavi as I indulged in official duty in Bangalore. With the start of 2013’s Monsoon, Gavi came to the focus once again. I spent some time looking at the photos, and badly wanted to go there. It was raining this year like never before – so the prospect of travelling in heavy rain and the chances of a road blockade made me put off the wish for now. There comes a post on Facebook – a plan from the Kerala RTC Fans group about a trip to Gavi and some parts of Idukki. This is just what the doctor advised! The dates were very favorable as well – the third Saturday and Sunday of July 2013! 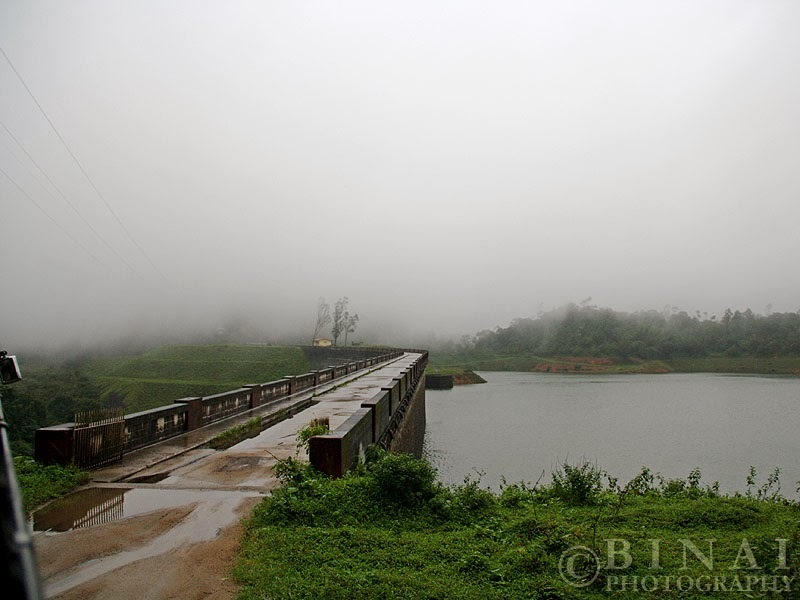 The trip plan looked great – spread over two days, covering most parts of Idukki and ending at Kottayam. Some last minute changes in my plan meant that I made some changes in my route, splitting away from the group on the second day. The well-surfaced roads of Kerala (pun, obviously, intended) and the entertaining traffic block at Walayar (pun... again, intended) meant that I reached Pathanamthitta very late. I had planned a lot of activities at Pathanamthitta, but the late arrival meant that I did not have time even to get fresh! 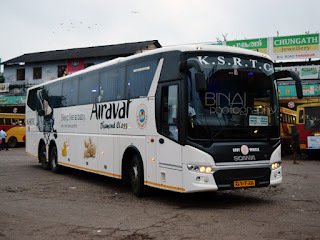 I literally got off the Volvo and headed straight to the KSRTC bus station, and then into the Gavi bus. 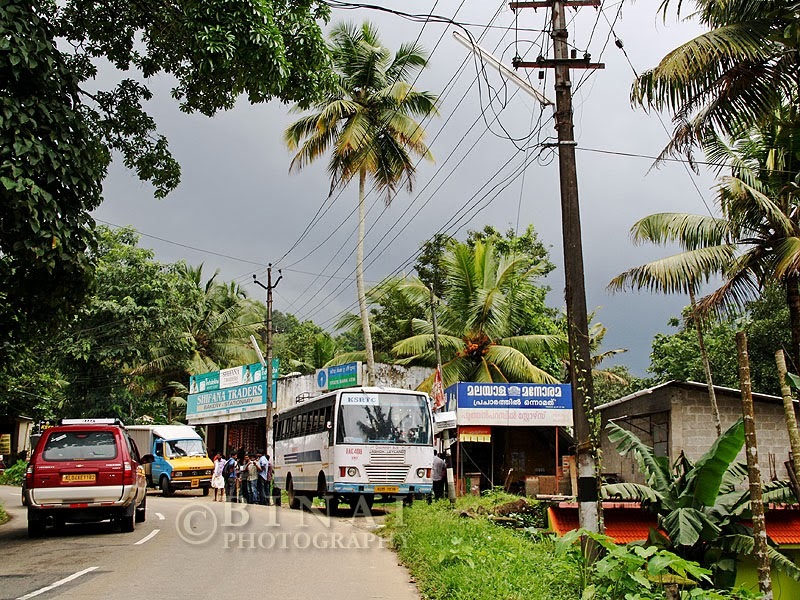 This was my first visit to Pathanamthitta – sadly, but no time to enjoy the visit. As I walked into the bus station, the Gavi bus was brought out of the garage and parked at the departure point – most of the seats were reserved by our group. 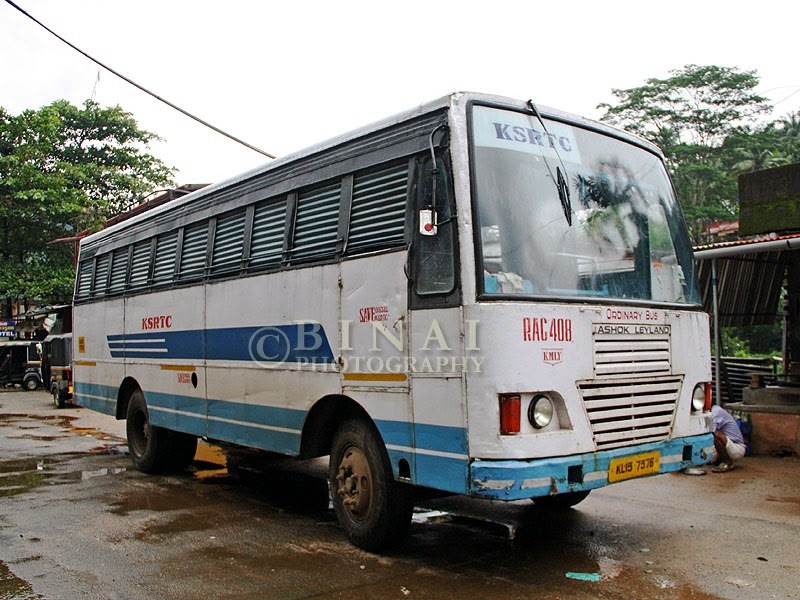 The bus was RAC408 of Kumily – a 2009 model Ashok Leyland Cheetah 176” wheelbase bus. The bus! RAC408 of Kumily. The bus got moving at 1230hrs. I had purchased a few packets of biscuit from a stall there – this served as my breakfast and lunch. The driver (Volvo Babu) was fast right from the word go – he was rash at times. Traffic on the road was on the higher side, mainly comprised of Sabarimala bound vehicles. Sometime into the run came the first hurdle of our journey – a white Tavera. 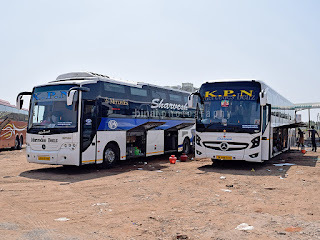 It so happened that the Tavera guy decided to bang his brakes during a high speed overtake – our bus was right behind, and our brakes didn’t bite that hard – so we decided to rest on the Tavera’s back – yes! We had an accident. The Tavera flew a few metres ahead, while our bus retained its position. Tavera’s rear bumper and rear door was gone – we now blocked traffic. A few people from our group stood on the road controlling traffic, while Police cops came to settle the accident issue. Both the vehicles were taken to the police station at Ranny-Perunad – and a few rounds of negotiations happened. In the meantime, it poured down heavily – making us remain indoors. We lost about an hour, and we got moving again. As the driver was back on his seat, a lady sitting in the bus started arguing that she was hurt due to the hard brake and that she too needed compensation. The driver was surely disgusted – he offered to go back to the police station and settle the issue there – the lady shut up as she heard the word “Police”. ...still waiting.. and its raining.. er! Pouring! The driver was back in business – but he had mellowed down now. Somewhere near Laha, the bus turned off the main road and entered a narrow road – it was an unsettled ride. Rains meant that we kept our windows closed, but the environs appeared quite picturesque. 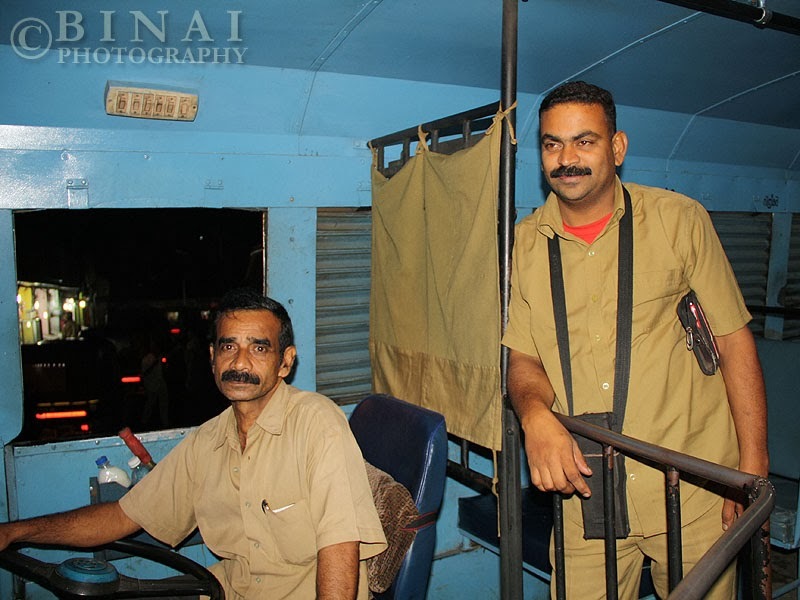 We stopped at a Chittar bus station on the way – no passengers got in though. By now, we were desperately waiting for our lunch break. We stopped for lunch at Angamoozhy – around 3pm. It was a small hotel – the lunch was tasty (I was desperately hungry anyway). We started off after Lunch at around 1535hrs. The forest road begins from here. The road gets really narrow now, and is hardly surfaced. We all grabbed seats at the front – some of us on the three seater, others on the bonnet and some others standing. The driver was excited seeing our enthusiasm, and he explained about the route, his experiences while driving on the route. The forest was quite dense, and the road quite narrow. We crossed vehicles once in a while – this continued till we reached Moozhiyar. This was a dam township – residential areas, some offices, a post office and a health-centre made the township. Almost all the passengers in the bus except the 13 of us, one lone passenger and the two crews remained in the bus as we started from Moozhiyar. En route, we encountered some rogue branches – the bus was fully tooled – a heavy knife, toolkit to change tyre, a spare tyre and some metal rods and stuff. The driver took out the knife to cut the rogue branches to shape and continued the journey. 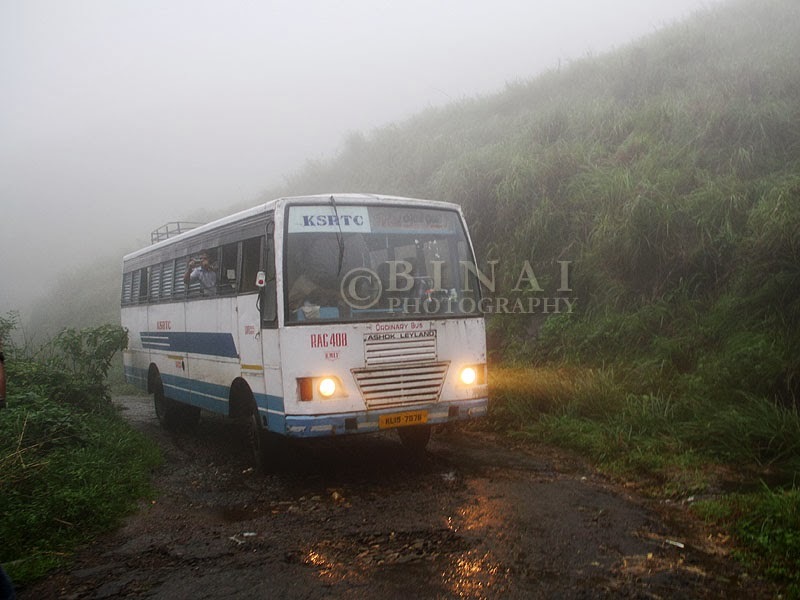 A lot of fog descended as we continued the trip – our bus did not have a fog lamp (a sore missing). Our driver was a veteran on the route (he has been driving in the route since 2009) and he managed without the fog lamp. The road was barely visible. We crossed out pairing bus (RNC869 of Pathanamthitta) somewhere in the forest. We stopped somewhere for a photo shoot – it got darker as we progressed, and it rained most of the time as well. Crossing our pairing bus.. somewhere in the forest. Riding through a dam.. that is called a foggy route! About to enter a dam! The crew after dropping us at Kumily! We passed Kakki and Pampa dams before we reached Gavi. Somewhere on the way, the driver stopped the bus on the road – we initially had no idea why he stopped. But the reason stood on the road – a small elephant family! The bus was switched off, and we waited for some time. The elephants cleared out, and we started off again. We reached Gavi around 6.15pm or so. Gavi is a small township nestled in the forest – it has bare minimum facilities, like a tribal school, a post office and some odd shops. There is a full-fledged Kerala Forest Development Corporation (KFDC) tourism centre as well. 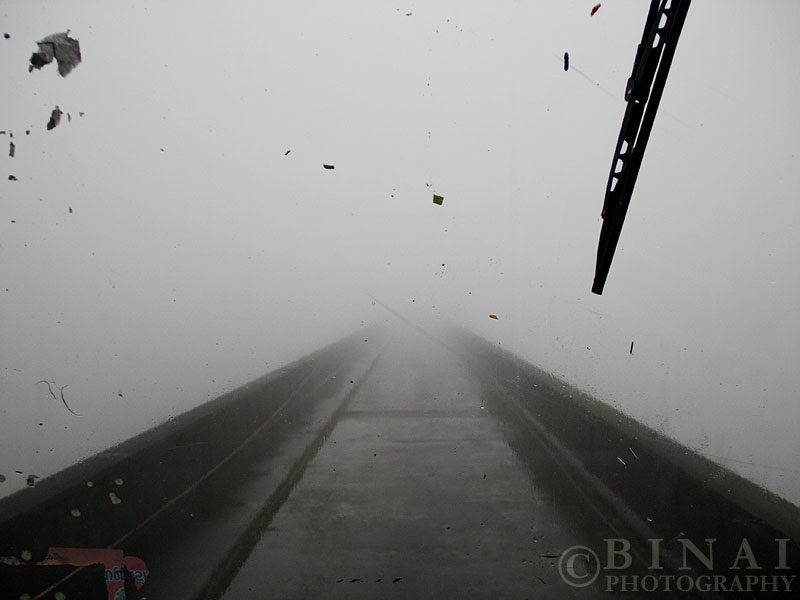 It was pouring down quite heavily as we reached Gavi – so bad that most of us couldn’t really see the township well. The bus got packed by now – a group of drunken men whistled and howled as we crawled through the forest. It was dark all around and nothing could be seen. The last point in the forest was Vallakkadavu Check post. I realized that we were near Mullaperiyar only after checking the location on Google maps!! After the check post, we entered into civilized areas – a lot of houses were seen all around. 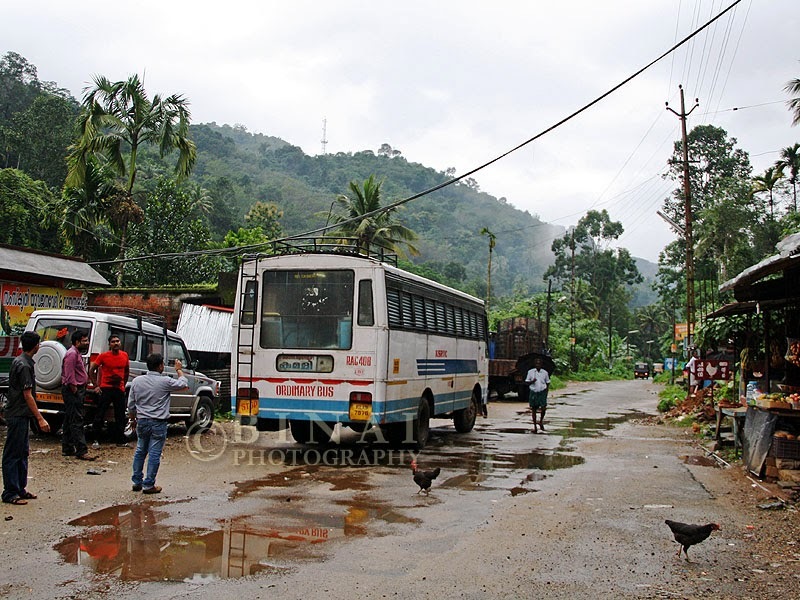 The bus reached Vandiperiyar around 1920hrs – quite late from the scheduled time. 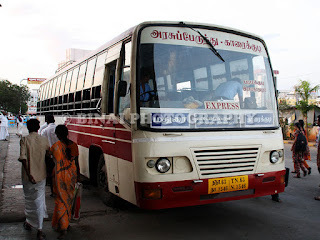 The group got off here in pursuit of another bus, while myself and Jayasankar decided to continue to Kumily in the same bus. 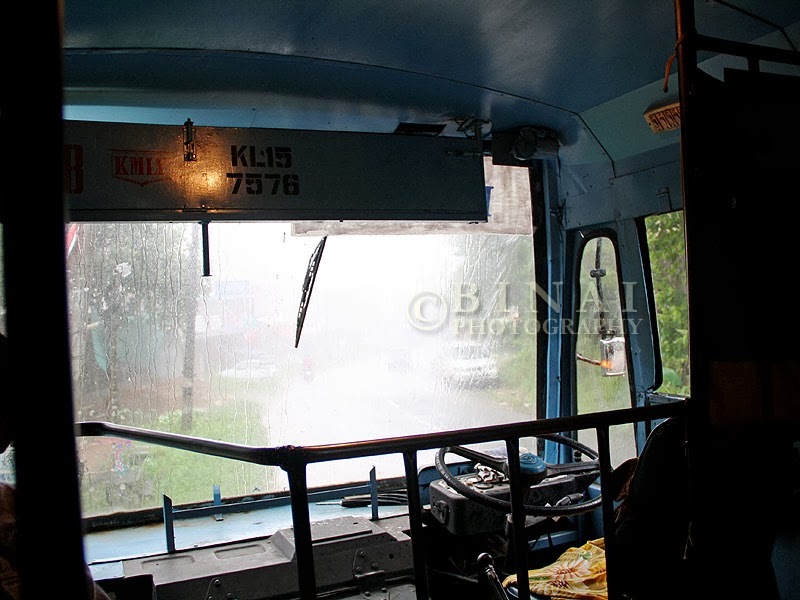 After Kumily, it was just a few of us in the bus – the road was quite narrow, and the shoulder wasn’t really well paved. The rains meant a lot of slush had formed, and it was risky to enter the shoulder at all. We finally reached Kumily at 2005hrs – we got off the bus after bidding adieu to the crew. The first day ended at Kumily in a hotel right behind the bus station. awesome Binai ... excellent route ... excellent photograph and write-up !! Nice!. is reservation facility available for this bus??? i have checked the KSTRC online booking but i haven't find this bus. No reservation. This is an ordinary shuttle service.